Rome, Georgia native Brad Ray began playing guitar at the age of twelve. He honed his playing skills listening to a diverse palette of artists; Third Eye Blind, Prince, Whitesnake and Maxwell, just to name a few. From these influences, he began to develop his own unique style of playing and composing songs. Fast forward a couple years and Brad is studying at Temple University in Philadelphia, PA. It is there that he really began to grow as a writer composing literally hundreds of songs and performing when he could fit it in between studies. He realized there that his heart was that of an artist and he left school to pursue a career as a songwriter and performer. 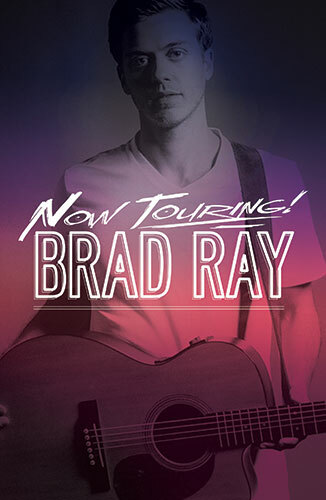 In 2015 Brad launched his professional touring career and performed with Howie Day (“We Collide”), Paul Pfau and Steve Everett of (The Voice). In early 2016, Brad joined forces with Rock Radio favorite: Sister Hazel for his first U.S. Tour and then joined Alt/Rock legends; Hinder for yet another tour of the country. This Fall he once again toured the U.S. with Jon McLaughlin and Marc Scibilia. In 2017, Brad and band toured with XEB throughout the U.S. It has been a very busy couple years with 4 tours and a new album completed! The new album on Stingray Records is the eponymous release; Brad Ray. This is Brad’s first “Official” release. The record was recorded at legendary Sound Emporium Studios in Nashville, TN. Studio aces; Greg Morrow (Joe Bonamassa), Steve Mackey (Wallflowers), Dennis Wage (Delbert McClinton, T. Graham Brown), Dan Dugmore (Linda Ronstadt, James Taylor), The McCrarys (Bob Dylan, Carrie Underwood) and others were enlisted for the project. Grammy nominated engineer, Steve Marcantonio mixed the project.The record was produced by Ben McRee. The album will be available late December 2016 on all the usual sites as well as here on Brad’s website. Stay tuned for for updates. Keep up with Brad here and on his social sites as well. Catch him on tour if you get the chance!